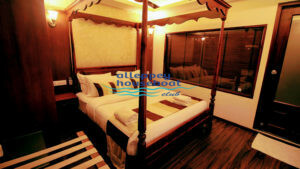 The Ultra Luxury Houseboats offers very superior class facilities like spacious living area with traditional wooden ceiling with overlapping woods, bedrooms with best interiors. Boat will be fully glass covered, glass windows stretching across the wall, it offers a clear picture of the backwaters. Full time AC is available in rooms and the superior food menu is fixed. Boat consists of a conference hall which makes the best choice for office trips and family, friends and for honeymoon.